I’m failing at redirecting my Jenkins to use my subdomain (build.core-network.us) and not require :8080 port slapped behind it. And of course build.core-network.us has correct DNS entry (and it works fine when I add :8080 port to it). I found 4 other posts like this with 4 different VirtualHost recommendations and either they’re not for me or I’m failing to use them properly. Update 2: I did sudo /etc/init.d/apache2 stop and then start, didn’t help. Drop the :80, that's not part of the Host: header. What's happening is that this isn't matching your request, and your system is falling through to another virtualhost (the first one loaded, if nothing explicitly matches). 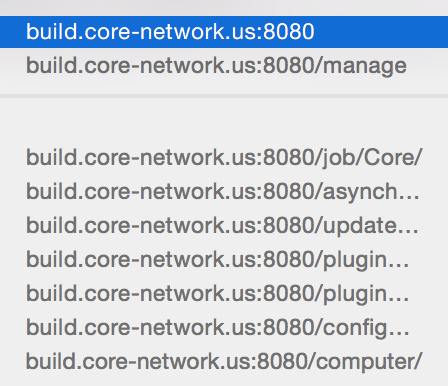 www.build.core-network.us should be working now, which you can also use to test. Also, you don't need the <Proxy> section, that is only for forward proxy. In most cases ProxyRequests is off already, so that's probably redundant, but doesn't hurt. You forgot about the application path. proxypass /jenkins to port 8080? Varnish on 80, nginx on 8080, on which port to put jenkins?